In the previous article we covered some of the most popular electric skateboards under $300 and as we've seen this market corner was very diverse – some great picks out there, some solid, some of them not so great. Still, they always came with an asterisk. "A great skateboard, BUT…"
That’s ok, in order to reach the low price, you need to make some compromises. And now we’ll take a look at some of the best electric skateboards under $500. While still not premium units (for that pleasure, you’ll need to spend a couple of hundreds of dollars more), these boards offer solid quality and make very few unpopular trade offs along the way. So, let’s take a dive into the e-skateboard mid-range goldmine with these seven picks. If you’re in a hurry, these three will satisfy your needs for sure (we sorted the recommendations based on the price). Get there faster with a 18.6 mph top speed and super responsive acceleration. Climb a 25% grade with speed and ease. 8 layers Maple wooden deck of the board giving it more flexibility and sturdiness. Although the units we are going to cover on our list make a huge leap forward when it comes to the quality (at least compared to the previously reviewed products) we have still not passed the point where we'll be able to make the choices based solely on the design and advanced features. So, pay attention to the following factors when making a purchase. Generally speaking, electric skateboards are the units that take a lot of beating over the course of their lifetime. This comes especially true when we talk about the off-road units that need to traverse difficult terrains like dirt and gravel. It is in your best interest to find the board that will be able to sustain such abuse. Also, you should do your best to find a product that includes a comprehensive warranty to make sure manufacturing errors don’t get in the way of your riding experience. Also, read the fine print to see what kinds of malfunctions are covered. Although the one-year warranty would be an ideal solution, any manufacturer that allows you at least six months to test the unit should come under your radar. Of course, the overall quality of an electric skateboard doesn’t depend only on the craftsmanship - the choice of the materials plays just as big or even a bigger role. Let’s take a look at some of the usual suspects we will most likely see in this range. Maple – Usually coming from the forests of the Great White North, maple is a material that’s very durable, offers great stiffness and thus good control over the board, but also has natural vibration dampening properties. Some of the more premium models also feature two layers of bamboo sandwiching the maple core, which makes the deck more flexible and compensates for the maple’s stiffness. 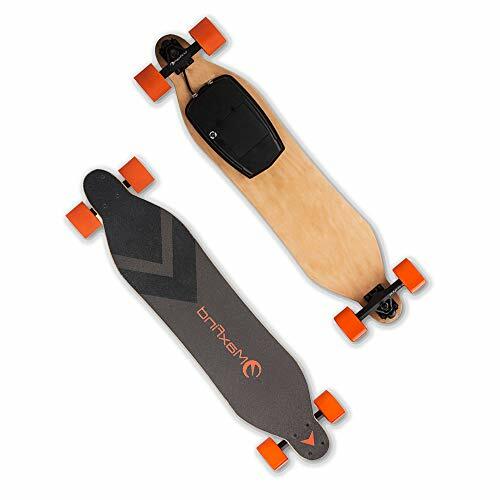 Carbon – Carbon is a composite material that is characterized by high-stiffness and low weight, which makes a solid choice for electric skateboarding. The good thing about the material is that its properties can be drastically affected by changing its core, which gives the designers more room to play with. On the downside, carbon is much more expensive than maple. When it comes to the wheels, the things are much simpler. Most of the offers in this range feature solid polyurethane wheel capable of managing city terrains. However, if you are buying an off-road unit, make sure it features high-quality pneumatic tires cause the wheels alone will provide a very rough ride. Battery capacity is one of the most important properties of an electric skateboard. The more powerful the battery is the greater will be the distance the board will be able to traverse in one charge. Unfortunately, a bigger number of ampere hours don't always translate to a wider range. How much the board will be able to pass in one go is largely impacted the weight of the board, the motor power and, finally, the weight of the rider. Therefore, when you check the specs of the board, take a look at the range that describes how far the unit will be able to go in kilometers rather than ampere hours. Although this number can be affected by the weight of the rider and the speed you're going at, it presents much clearer info about the unit's overall capability. Hub motors – Hub motors are very light, compact and cheap. They also contain very few moving parts which makes them rather quiet and less prone to damage. On the downside, hub motors are built directly into the wheels so they produce less torque. Still, they perform more than well when mounted on street units. Belt drives – As the name suggests belt drives turn the wheels through connecting belts. This solution is far noisier and harder to maintain but produces excellent torque. Since you get more bang for the same amount of juice, this also a more power-economic option. Which one of these two options you are going to opt for largely depends on your driving preferences. We already mentioned this topic when we talked about deck materials but it's worth repeating. Stronger and stiffer decks allow you great control over the wheels and board in general. They do, however, provide a pretty bumpy riding experience. On the other hand, more flexible boards are very pleasant to stand on, but at the same time feel floppy while riding. A perfect board lies somewhere in between these two extremes. If all the topics we covered above were something we could call skateboard’s core features, advanced features are all the small details that improve riding experience but are not essential for the unit’s overall quality. We have finally come to the point where we can introduce a bit of variety into the selection. We are, of course, talking about the off-road skateboards. Let’s break down some of the main differences between them and the street boards. Street boards – Lightweight and reasonably powerful, street skateboards are designed with casual commuting in mind. Because of that, they usually have a pretty good range that can go all the way up to 25 kilometers. Off-road skateboards - As opposed to their street counterparts, off-road skateboards are tough, heavy, they feature more powerful motors, and have a set of oversized wheels wrapped in pneumatic tires. Because they are quite heavy, their range usually suffers as a result. Now, here is a third product that follows a similar pattern like the previous two – high-quality skateboard that contends for the crown of the mid-range segment. The specs are on par with the units we already reviewed, so the final result will certainly be tight. Choosing the best will be a bittersweet task, but tons more satisfying than struggling to find one quality skateboard. Let’s start with the build and immediately move one important consideration off the table – Blitzart has found the perfect combination of ingredients to make the skateboard that will be able to absorb most of the bumps, easily cut the curves and allow riders great deal of control over the wheels without producing wobbly deck or resorting to curved design. This is achieved through six layers of high-quality maple sandwiched between two layers of flexible bamboo. The deck is straight as an arrow and flies just as fast. The top surface is graced with serviceable grip tape which is not amongst the best does a solid job at keeping your feet in place. Polyurethane wheels are a completely different story and do a great job absorbing the shocks. A couple of springs would certainly further improve the performance but the skateboard handles excellently just as it is. We have to give a special shout-out to steering which feels natural and effortless. You will be able to easily turn the skateboard within the radius of only two meters. The specs are more on pair with Backfire new G2 than WowGo S2, which leaves something to be desired bit still produces snappy and reliable performance. The speed is great, range just a couple of kilometers behind the fiercest competitor. Hub motors powering the whole thing are powerful enough to climb reasonable slopes. So, we have come to the point where we have to declare the winner. True to its name, Hurricane takes the title but just barely. All of the three units that competed for the top sport were great and fun to use. The overall feeling is that Hurricane balances its specs the best. Some of its areas may feel lackluster, but not to the point where they can’t be compensated by the well-built deck and extremely satisfying performance. So we already established that Hurricane is pretty fast. Speaking in cold numbers, the skateboard is able to fly at title-worthy 23 mph/37 km/h. The range of 16 kilometers does fall short from the performance of S2 but not too much – definitely not to the degree where the Hurricane’s title will be in jeopardy. Finally, we have a very solid max load of 114 kg and much less flattering battery charging time of three hours. The latter mention could definitely be better but it’s not uncommon for this particular price range. Much like Backfire New G, Blitzheart’s Huracane relies more on its performance than sp23ecial features. We can justify this oversight only to an extent. The next entry will easily demonstrate that a couple of bells and whistles don't cost tons of money. The Hurricane may provide the best performance in the price range, but two-speed settings leave leave a lot room for improvement. Best Budget Pick, Great value for money! Tomoloo Hover Board is a product that exists completely in its own world. Comparing it to other products from this list wouldn’t make any sense. But, the unit is an electric board and it packs some very unique features, so it’s definitely worth talking about. So, let’s move some of the things off the table first. 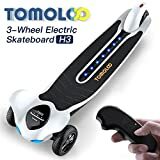 Tomoloo’s Hover Board should be considered more as a three-wheel electric scooter than anything else. Riding it will require to suppress all of your skating urges and leave the flips at home. Second, the design of the product is… Well, let's call it controversial. The manufacturer claims the design language was inspired by the dragons of Norse mythology. We claim the unit looks like a piece of How to Train Your Dragon merchandise. Still, the kids are going to love it and the people who take their image less seriously will certainly draw more than a couple of curious looks. Now, we are very happy to say that the look of this skateboard/scooter is very deceiving. We are talking about a genuine beast with specs taht reflect the manufacturer's intentions much better than the misguided design. This bad boy is fast, lean and durable. And out of all units we covered so far, this is the one powered by replaceable Tesla battery. The mainboard program also does an excellent job at balancing the scooter so riding will be safe for children even with all that power under the deck. The skateboard’s wheels are also pretty substantial. Sure, you won’t get any luck with the tough mountain tracks, but the unit is more than capable of traversing the common city obstacles. All in all, we are talking about a genuine oddball if there ever was one. Still, Dragon Knight offers surprisingly strong performance that can easily stand toe to toe with the stronger contenders we pointed out earlier. Of course, there are some limitations that are the direct consequence of the product’s type and design philosophy. But, if you are ready to take it for what it is, this Dragon Knight may be the most pleasant surprise on the list. Although it looks pretty bulky, Dragon Rider H3 is surprisingly light. It weighs only 10 kilograms which is more than reasonable taking into account all the goodies the unit has to carry (more on that below). Dragon Rider is powered by the 250W brushless motor, it can reach the speed that goes up to 15.5 mph/25km/h and is capable of traversing 20 kilometers in one charge. The max load is more than commendable – the board can carry up to 120 kilograms of weight. If some of the previous units we covered suffered from the lack of advanced features, Dragon Knight H3 packs too many to count. So, you get shock-absorbing springs, built-in Bluetooth speakers (we're dead serious), built-in LED screen that showcases the relevant info about the board's status, a couple of different riding modes, front and back lights, and the bunch of LED lights that are packed that are there just for the sake of fun. The fact that all these things are squeezed into such an affordable price range is truly praiseworthy. Finally, we get our first off-road electric skateboard in the entry-level and mid-range price segments. That, by default, makes this unit a worthwhile purchase – this bad boy can go the places other entries can only dream about. 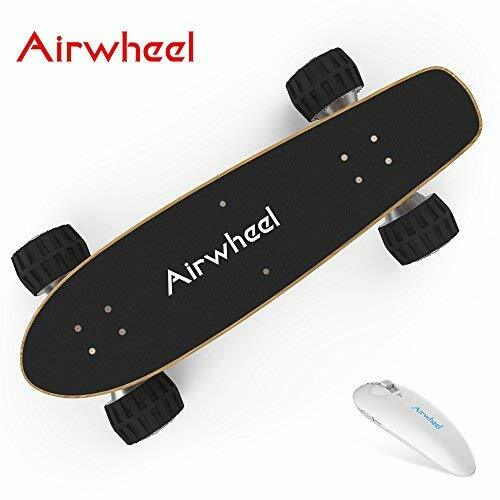 However, giving this skateboard a spotlight only because it can take off-road detours would do Airwheel a huge disservice. This is one extremely well put together piece of hardware even on its own. Let’s start with the build components. The deck is made out of high-quality Canadian maple wood that looks like it can take a lot of beating. Also, you get a nice, raised kick-tail that makes sudden breaks and sharp turns on rougher terrains considerably easier. The 4.7-inch wheels which are mounted on a high-quality aluminum axis are excellent and elastic tires do a great job of absorbing excessive bumping. So, all is well in the structural department. What makes this unit so impressive, though, is the fact the unit’s core specs and overall performance somehow manage to stand toe to toe with this extremely solid foundation. M3 is fast, responsive, stable and features incredible range (taking into account how much pressure is put on the battery). You won’t experience any twitching or jerking whether you are taking a slow city joy-ride or flying across the gravel tracks. So much power under the deck can throw less experienced riders off balance, though, so if you consider yourself one, take some time to practice before you push the board to its limits. Also, powerful motors and even more powerful battery have to take the toll on the unit’s weight. Be aware – this piece of hardware is heavy. Do your best to charge the battery to 100% before you start roaming tougher tracks - you don’t want to carry this board home. So in the end, there is very little to take away from this board, with the exception of some of the common tradeoffs that need to be made when you're building an off-road unit. Don't get us wrong, M3 is far from perfect, and there is a lot room for improvement, especially in the features section. But, at this price point, there is really nothing serious to complain about. As you would expect from an off-roader M3 is quite heavy. It packs whole 11.55kg of weight. However, this is the only compromise the Airwheel has made, at least in the specs department. The unit is capable of breezing at the speed of 12.4 mph/20km/h in the range of 19 kilometers. Keep in mind that the latter number can be drastically impacted by the rider’s weight and the type of terrain. However, it is good to know that the board can take up to 100 kilograms of weight which is pretty impressive. Charging time is not amongst the fastest on the market but not terrible either – the battery goes from 0 to 100% in about two hours. Unfortunately, M3 is severely lacking in advanced features, but some corners had to be cut to reach this price point. Once again, we are far more satisfied with the good performance and strong build quality than some gimmicky buzzwords. What you get out of this smart calculation is a solid remote that allows you to choose between a couple of different speeds settings, which is more than ok.
"Not Recommended, nothing special here"
When you take a look at enSkate WoBoard Mini, it’s easy to see that manufacturers tried their best to push the product into the mid-range class by any means necessary. The fine touches are all over the board – a raised tail, cool branding on the back wheels, a built-in LED screen that shows you how much battery you have left. They are all very cool. Still, these upgrades are far from enough to warrant the $50 price bump we saw over the models we saw on our under $300 electric skateboard roundup. Let’s see how well the unit is built and how well it performs. Well, the build quality is quite solid (maple deck looks like it can sustain a fair amount of beating) and the sandpaper overlay we can find on the top is an especially pleasant surprise. Forget the rubber – this bad boy is going to keep your feet in place. Unfortunately, the core specs are not that impressive. Don’t get us wrong, they are far from bad, but since you are going to open up a wallet a bit more this time, you can hope for something that will push a boundary in at least one of the important categories. Performance is roughly on par with the specs – solid but nothing to write home about. The unit is stable and accelerates with ease. There is one quirk, though. When you keep the acceleration button pushed longer than 15 seconds, the board will continue to accelerate and switch to auto-pilot mode in which you don't need to keep the button pushed anymore. This solution has its pros and cons. The bad thing about it is that braking from this auto-pilot mode is very twitchy and without any subtlety. If you are not prepared, you can easily lose ground. Still, this small problem doesn't ruin the solid impression this board is trying to make. In the end, we are talking about a unit that doesn't try to impress the audience with bells and whistles, but rather with the strong build quality and reliable performance. For the most part, it succeeds. As the name suggests, enSkate WoBoard Mini is a unit that is aimed primarily at ladies and youngsters and the specs are in line with this commitment. The length of the board measures very compact 70cm while the weight stays below 5kg. That is good, because you will do your share of carrying with this one. Although the Samsung battery performs satisfying the dual brushless motors are obviously putting too much pressure on it, producing the range of only 12km. However, you are able to climb inclines up to 15 degrees as a consolation prize. The speed clocks at solid 12.4 mph/ 20km/h, which is ok.
As we already mentioned enSkate WoBoard Mini packs a couple of small details that make the riding more pleasant. So, we do get our sandpaper top overlay, built-in LED that shows the battery status and, coming as a very pleasant surprise IP 54 certification. The auto-pilot mode definitely has its merits, but the decision to make it mandatory is quite dubious. 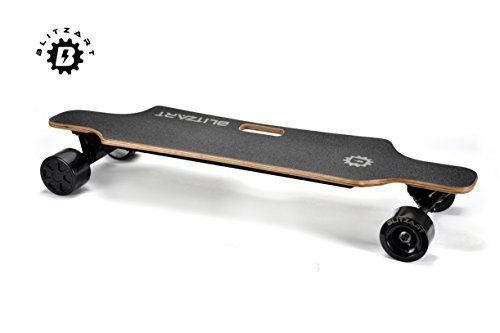 Maxfind 38’’ Electric Skateboard can be best described as minimalistic. The unit doesn’t try to make any design statements or to charm the buyers with some ridiculous gimmicks. But, there is a lot of beauty to be found it this simplicity – especially if you are in favor of the black and orange combination the board has all over its body. What’s even more important, all the building blocks of a good electric board are hidden under the hub. So, for a start, we get a rock-solid 8-layered maple wooden deck that strikes the almost perfect balance between sturdiness and flexibility. The bumps along the way are sufficiently absorbed and you'll never get that "muddy" feeling under your feet. In spite of this beautiful combo, the title of the main star of the show has to go to the powerful 600W motor that produces solid speed, excellent load, and stable performance. Built-in Samsung battery does its best to provide a decent range as well. The board also boasts with IP 56 certification, which means you’ll be able to take your rides even during lighter rains. Is there something to take away from the skateboard then? Certainly. Camber deck design is definitely a clever way to improve the deck's flexibility but may pose a problem for inexperienced riders who would benefit from a less sloped foothold. However, this decision has a lot of rhyme behind it, so we'll give it a pass. Polyurethane wheels are nowhere near as strong as the deck. They will be able to breeze across smooth paved surfaces but keep them away from rougher asphalt. Harder ground can tear them apart surprisingly easy. Still, these flaws are not uncommon in this specific price range, and definitely not deal-breakers. We’ve seen much worse sins committed on the road to lower price. What we’re left at the end is a very solid and snappy board built for all ages and audiences. What else could you ask for? This unit features some very solid specs across the board. The average speed goes all the way up to 16.7 mph/27km/h (lighter riders will be able to push the board to 18.6 mph/30km/h) and the achievable inclines slope to pretty impressive 25 degrees. The weight of 5.5kg is manageable and the range of 16km decent but far from impressive. Again, we've seen much, much worse. Also, this fairly limiting range is warranted by the fact that the board can carry as much as 120kg of weight so we won't complain about it. Furthermore, the battery charges with an hour. You will be able to easily get your board battle-ready during the casual coffee breaks. When it comes to the features, Maxfind 38’’ Electric Skateboard feels pretty barren. You get the by-the-numbers cheap-looking controller that allows you to choose between different speed settings, grip overlay on the top of the deck, and nice maintenance kit hidden in the package. Still, we would much rather take good performance over cheap gimmicks any day. When trying to make their name on the market, manufacturers are often faced with the choice whether to go all guns blazing or to put their eggs into carefully selected baskets and hope that they made the best choice possible. WowGo 2S is a product that was obviously conceived by the latter philosophy. Fortunately, the choices made by the manufacturers have paid off – big time! 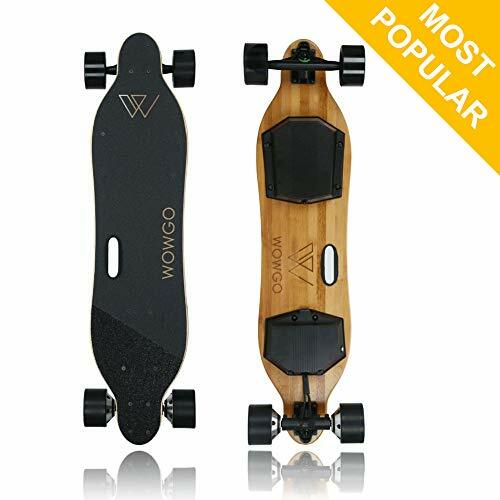 On first glance, WowGo 2S looks pretty standard. But, take a closer look and you will see that this time, the deck is made out of bamboo rather than maple. This solution entails a fair share of controversies. Compared to maple, bamboo is lighter, more affordable and much more flexible. This way, leaning becomes far easier and the shock absorption drastically improved. Bamboo also features very good durability. On the downside, the deck is simply not as rigid as it would be if it was made out of maple which has its effect on handling. Some riders will like this change of pace others will frown. It's really up to your driving preference. The good news is that the top of the deck is covered with high-quality grip tape that improves the level of control. Another controversial choice is the inclusion of camber deck design. The manufacturers have obviously opted to double down on the whole flexibility gimmick. The area where this skateboard truly excels is the powerful pair of 250W hub motors. 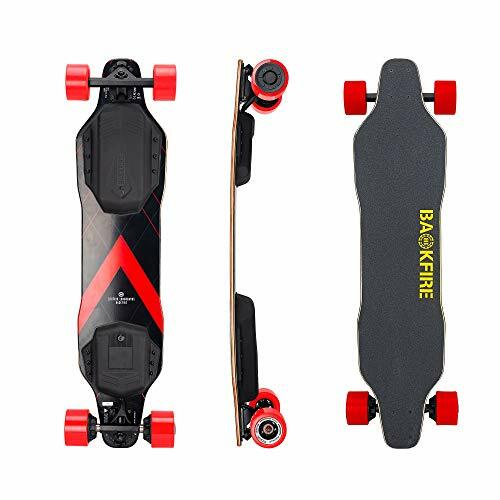 The skateboard is incredibly fast (for its price range, at least) and the board is capable of climbing some pretty steep slopes. This feature alone is easily the board’s strongest selling point and easily compensates for all the flaws it may have. And then, there are the small touches in the form of the quality remote, regenerative braking and removable (and replaceable) battery. As for the riding experience, which is still the most important quality of an electric skateboard, it’s very solid. The board is flexible without being too wobbly, and maneuvering is as seamless as it gets with this choice of materials. Still, acceleration may feel a bit overwhelming. Overall, an excellent entry that shows how smart investments are made. The made compromises are cut to a bare minimum and the resulting price/value ratio is off the charts. When it comes to the specs, WowGo S2 covers all the important marks. As we already mentioned, the motors are very powerful, and the battery does a great job providing sufficient juice. All of that results in pretty sweet 18.5 kilometers of range. Charging the beast takes long three hours but the battery is replaceable so you can always switch it for the spare one. From here, it only gets better. The skateboard zaps at the impressive speed of 23.9 mph/38.5km/h and climbs the slopes that go up to 30 degrees. Max load is on par with speed. The board can carry commendable 127 kilograms of weight. All that comes packed into a manageable weight of 7.6 kilograms. Features-wise the S2 once again makes a couple of smart choices. The speed settings are cut to three as opposed to more forgiving four, but you get a high quality remote with an LED screen. You also get a regenerative braking system which is a very nice addition. Backfire New G2 is a product that is in all regards pitted against WowGo 2S so some comparison are inevitable. That’s ok – judging any kind of product is impossible without a good reference point. And you would be hard pressed to find a better reference point in this range than S2. let’s take a look who will come out as a winner from this small battle royal. Let’s start with materials and build quality. This time, we can see a comeback of the high-quality Canadian maple that coupled with mid arched designed provides a perfect balance between sturdiness and flexibility. A smart choice that doesn’t produce too big of a price gap. As for the wheels, G2 features pretty standard polyurethane units, with a slight twist – the back sleeves are replaceable. Throw into equation graphite grip tape on the top of the deck and you will get one very well-rounded piece of hardware. The design may look a bit jarring to someone, but it’s really a matter of taste. Overall – no complaints in this department. The specs are on par with the high standards set by S2. As a matter of fact, they even surpass them in some regards because, this time, we get a pair of 350W brushless hub motors. However, the battery is not that well paired, so the range suffers a bit as a result. Bottom line, the unit feels powerful, but not that well balanced. The things are not made better by the fact that you get to choose between two speeds which reduces the level of control you have over the board. Finally, we have to talk about performance. This feels like the area where manufacturers put the most effort in. The skateboard packs an advanced controller module that makes speeding up and slowing down extremely pleasant and steady. At no point you will feel that the deck is slipping under your feet. Cutting the curves is a breeze. Honestly, deciding a winner between G2 and WowGo’s S2 is tougher than it should be. Both units have their pros and cons. G2 offers a more stable and steady performance. S2 has better-balanced specs and makes better use of its motors. This time, we will give a slight nudge to S2 because we think of it as a more rounded product. That doesn't make G2 a loser in any sensible regard. We are still talking about an excellent piece of hardware that is aimed at specific type of customers. As we already mentioned, G2 is a very fast unit – in ideal circumstances, it goes all the way up to 23.6 mph/38km/h. The range, unfortunately, struggles to keep up the pace – 16 kilometers are by no means bad but the competition did this job better. Also, inclines are not amongst the unit’s stronger features. 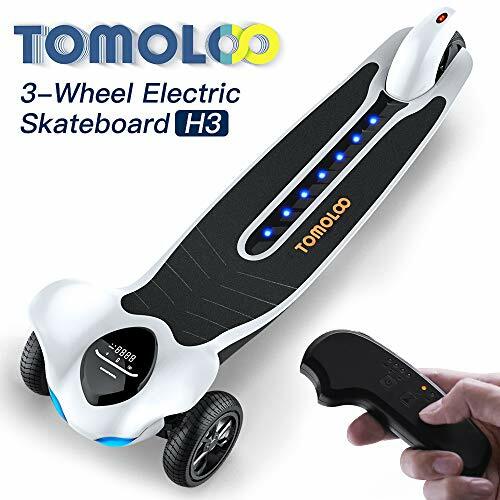 The manufacturer claims that the skateboard can climb the slopes up to 25%, but you will see huge drops in speed as soon as you start going up to 15. The weight of 7.5 kilograms is manageable and we have no complaints in this area. The battery, on the other hand, could benefit from better charging times. This way you have to wait up to 3.5 hours to get to 100%. One of the areas where G2 loses a lot of points are the features or the lack thereof. As we already mentioned, the solid remote you get in the package allows you to choose only between two basic speed settings. The advanced circuitry that handles the motors somewhat compensate for this issue though. Q: Are mid-range electric skateboards suited for professionals? ​It really depends what you consider under the word professional. Still, you will be glad to know that most of the corners that are being cut in the mid-range segment are cut in the features department. If you can live without built-in LED screens and other useful but not necessary additions, you will be able to find the unit that will win you a race or two. Q: Can kids ride electric skateboards? ​Sure, but the units that are too fast may be a bit dangerous for the youngsters. If you want to introduce your kids to the world of skateboarding, give them a couple of rids on the regular board, before they are capable of handling higher speeds. Q: How do electric skateboards benefit from raised kick-tails? ​Although not a mandatory part of an electric skateboard raised kick-tails certainly have a strong influence on their overall performance. Namely, they allow for much faster turns and easier breaking. More experienced riders use kick-tails to perform more complicated tricks. Q: How electric skateboards benefit from LED lights? ​LED lights can prove to be useful to riders in more than one way. First, they can provide quick and easy to understand feedback on battery status. Second, they make you and the board more visible in the dark, thus improving your safety. Last but not least, depending on their position, LED lights can light a small area around you, helping you to avoid immediate obstacles. Q: What is the range of mid-range electric skateboards? ​The market is changing very rapidly so it’s really difficult to provide the exact number. The boundaries are being pushed with each passing day. Still, most of the units that are currently available fall somewhere between 12 and 20 kilometers, which is substantially more than what you would get from the e-skateboards we looked at in our affordable electric skateboard mega-review. We hope you enjoyed this roundup of most popular electric skateboards that currently sell under $500. What do you think about our choices? Let us know and share the post with your friends on Facebook.